Chef Bernard Kinsella chopped ingredients for his cooking class at The Good Life Kitchen in Norwell. NORWELL — Kevin Riley loves to cook. Trouble is, the kitchen at home is the domain of his wife, Valerie. For the record: Under the tutelage of Good Life’s owner, chef Bernard Kinsella, and the able assistance of Valerie, Riley did a tremendous job creating the dessert of the night, pears poached in red wine. In fact, we all cooked up a storm, and had a blast to boot, which is the bottom line when picking up a knife and preparing a meal, Kinsella said. Details of the cooking schools mentioned in the story. With the proliferation of food shows on television, interest in home cooking has blossomed, Kinsella and others chefs said. As many men as women are taking courses these days, according to Pamela Beaudet, who runs Cooking With Pamela classes from her Walpole home. Beaudet recalled watching cooking shows as a kid, stirring pots on the stove, and pretending she was on TV. “I find with a lot of my friends, the men are cooking more. Men seem to be more fearless in the kitchen, not afraid to throw stuff together and see what happens,” said Beaudet, who is also a life coach. Many instructional chefs are teaching healthier food preparation, she said, a necessity in a nation plagued by obesity. In one of Kinsella’s recent classes — held in a brand-new, wide-open kitchen with two commercial gas stoves, an induction oven, and all manner of wonderfully sharp chef’s knives — four couples took part. Three came as a group, and the fourth happened to know the others. They were greeted by Kinsella with an assortment of cheese, crackers, hummus, and wine, and as the night progressed, all engaged in cooking vegetable and mushroom risotto, a soy-and-honey glazed salmon dish, and that earthy, wine-poached pear dessert. We did it under the guidance of the affable and animated Kinsella, who punctuated his lessons with the occasional “Boom!” much the way celebrity chef Emeril Lagasse uses “Bam!” only at a much lower volume. “That’s it, just like that, boom!” Kinsella would say as a student sliced reconstituted shiitake mushrooms. 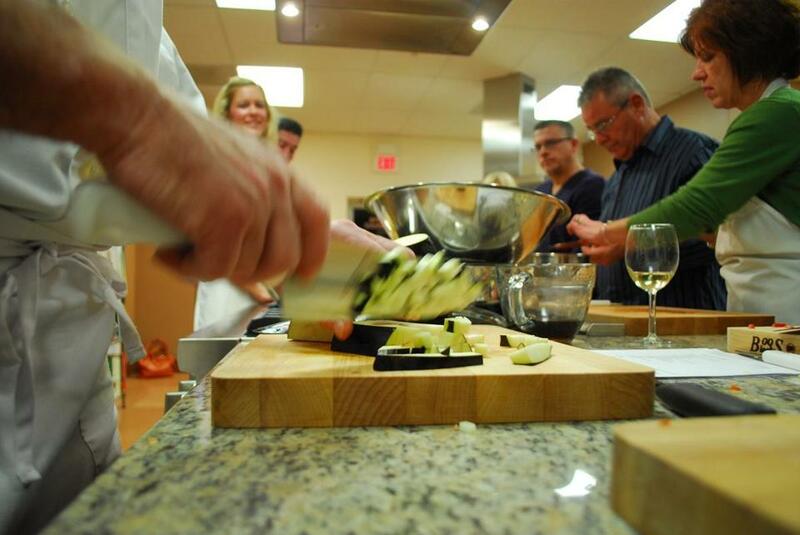 Cooking classes in the area run the gamut from healthy cooking to baking to nights for couples or singles. Kinsella’s offerings include cooking with local foods, or making risotto, candy, or soups. Also popular are courses at places like Whitman-Hanson Regional High School, through the Whitman-Hanson Community Education Main Street Extension, said Cheryl Wyndham, who heads a program that runs in the fall and spring. The program offers about 65 courses, and the 2013 choices will be listed online early next year, she said. “Our instructors are people with a passion for cooking, and we target an audience of about 30 to 55 years old,” she said. In Mattapoisett, Colby Rottler recently opened Commanding Cuisine, which is run through the town’s Recreation Department. Looking for something to do after retiring from the Federal Reserve Bank, he graduated in 2001 as a certified chef from the Johnson & Wales University culinary program. Rottler also donates his culinary talents to veterans groups and others who auction off his services to raise money. The biggest benefit of cooking classes, Kinsella said, is bringing people together and creating the communal sense of doing a necessary task together. “I think it’s a way to bring family closer together. We’ve gotten away from family meal times, I think,” he said. And creating some mouth-watering dishes doesn’t hurt. At the end of our class, we all sat down to gorge ourselves on what we had created, drink wine, and talk. Not much was left over, least of all Riley’s poached pear dessert, mounded with mascarpone, light cream, lemon zest, powdered sugar, and raspberries.